Last week, on the night Spain met France in the World Cup, Madrid was, as always, stiflingly hot. Plaza Colon, in the center of Madrid, was teaming with red-shirted fans, restlessly waiting to watch the match live from Germany. Local bars were similarly packed and anxious. 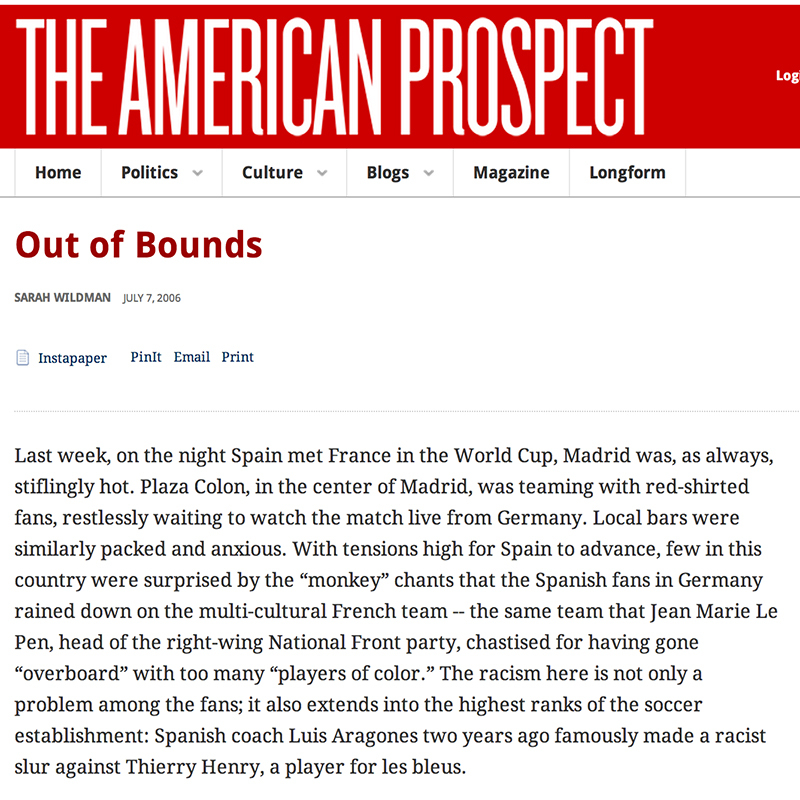 With tensions high for Spain to advance, few in this country were surprised by the “monkey” chants that the Spanish fans in Germany rained down on the multi-cultural French team -- the same team that Jean Marie Le Pen, head of the right-wing National Front party, chastised for having gone “overboard” with too many “players of color.” The racism here is not only a problem among the fans; it also extends into the highest ranks of the soccer establishment: Spanish coach Luis Aragones two years ago famously made a racist slur against Thierry Henry, a player for les bleus. If you've been watching the World Cup as obsessively as I have, you may have noticed the massive Say No to Racism banners that are displayed before each game, and heard the pronouncements and declarations against racism that are read after each national anthem has played. Indeed racism in the stands over the last decade would shock even the ugliest of fans in American stadiums. It's hardly an experience unique to the World Cup; if anything these games have been notable for their civility. UEFA (the Union of European Football Associations) and FIFA, the global governing body for soccer, as well as grassroots organizations, like Football Against Racism in Europe, or FARE, have organized conferences, player-ledcampaigns, and monetary penalties to combat the songs, the slurs, and other symptoms of soccer's racist underbelly. The picture is, fortunately, not all bleak, the campaign not mere lip service, despite backsliding on the part of the Spaniards. And those efforts have extended from Europe to the Middle East. Club teams in Israel, like everything else on that contested slip of land, have come to represent certain political inclinations. Tel Aviv is liberal, tolerant. In Jerusalem, Betar wears the mantle of right-wing zealotry, and it was Betar fans who unfurled the banner. The actions did not go unnoticed; Israeli soccer commentators and much of the rest of moderate Israeli society spoke out against the behavior of the Betar fans. The team was fined, and there has even been talk of shutting down their stadium as punishment. Some of the change is due to an organization that has not normally been associated with soccer. Three years ago, the Israeli civil rights organization the New Israel Fund put advertisements in Israeli newspapers -- written in Arabic, Hebrew, English, Russian, and even Amharic -- looking for people who were fed up with hate in soccer stadiums. “If you are interested in creating a voice of understanding and tolerance,” the advertisement read, “a voice to stop racism and hate, if you are interested in football and struggle for a better society, come be our voice.” The plan was modeled after the United Kingdom's anti-racist soccer organization Kick It Out: Fans would be sent into the stands undercover to monitor the dialogue they heard around them, the songs sung, the slurs uttered. The response to the advertisements was overwhelming. Mwafak Khalay, an Israeli-Arab who read the advertisement, called. “I believe in coexistence, a shared life,” Khalay told me, explaining his reason for wanting to take part in the program. We were sitting in a north Tel Aviv café with a Jewish Israeli monitor and Itzhak Shanan, a spokesperson for the program. Ohed Eyal, the Jewish monitor, agreed: “We are concerned about what is happening in our own house.” Suddenly at the New Israel Funds' disposal was a mega-team of volunteer soccer monitors. Within weeks, the daily newspapers around the country began to run a racism index of teams and fans. Monitors also helped change national law -- now police can arrest instigators of racial violence in the stands. “Israeli society is being changed,” said Shanan. “Israeli reality is changing. Open the sports magazines! They are now talking about the behavior of the crowd. We provoked the issue.” The soccer teams themselves began to act, embarrassed by their rabid fans and burdened by fines issued by the Israeli soccer federation. “Sport is the one element that can bring change,” said Khalay. After hopscotching across Europe these past few weeks and watching the World Cup in bars and homes from Paris to Madrid to Brussels, I find it hard to disagree. Saturday night, when les bleus defeated the normally dominant Brazilians, I watched in a bar half filled with yellow and green jerseys, the other half with the tri-color emblazoned on their cheeks. The World Cup is a playground of nationalism. But the ugliness of the flailing Spanish fans was the exception this year, and the French win -- though my neighbors will hate me for saying it -- was as just a penalty as any fines Spain could receive.